John (John C. Reilly) hasn't ever completely recovered from his divorce. A nice guy without any confidence, his life takes an interesting turn when he meets Molly (Marisa Tomei) at his ex-wife's engagement party. John and Molly hit it off but after a few dates, John begins to feel like Molly is keeping something from him. He follows her home one night (stalker much?) and discovers that her adult son, Cyrus (Jonah Hill), still lives at home. At first Cyrus seems to embrace his mother's new relationship but John soon finds that things aren't what they seem to be. Molly and Cyrus have an unnaturally close relationship and despite his objections to the contrary, Cyrus wants nothing to get in the way with that. Cyrus comically undermines everything John does, causing John to stoop to his level and force a showdown between the two. "Cyrus" is an interesting little film. Directing brothers Jay and Mark Duplass provide a well written screenplay and a bit of fresh life for a concept that's been used more than once. The characters in "Cyrus" are much more human than one might expect. John, in particular, is a very authentic "divorce broke my soul" kind of guy and Reilly gives depth to the character. Even Cyrus, who's more over-the-top than John, still has moments of realness when it would have been very easy to allow him to become a robotic generalization. 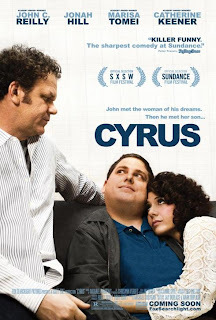 "Cyrus" is labeled as a comedy and at times revels in the (slightly) absurd but at its core it's a blended family drama with real heart. As weird as it sounds, you kind-of understand why Cyrus would steal John's shoes and that's saying something. My only real criticism of the film is the final 10 minutes, in which John and Cyrus attempt to work through their differences. While the majority of the film is fresh and vibrant, the finale is much more cliche, a cookie-cutter comedy ending. It doesn't fall apart so much as it just comes across as a cop out. Still, the Duplasses have crafted a heartfelt, organically funny movie that should provide them with a ticket to the mainstream.